This month’s LTS blog post features Zuxuan Ni and Yang Li, who are both interested in teaching Mandarin to older children in the U.S. 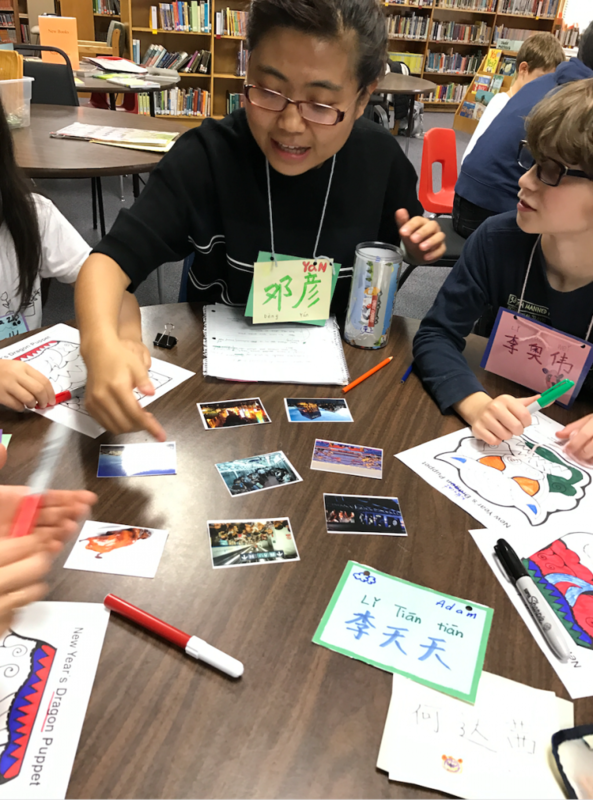 In LTS they have been taking some classes specifically focused on Chinese linguistics and teaching, as well as assisting middle and high school learners of Chinese at Oak Hill School in Eugene. 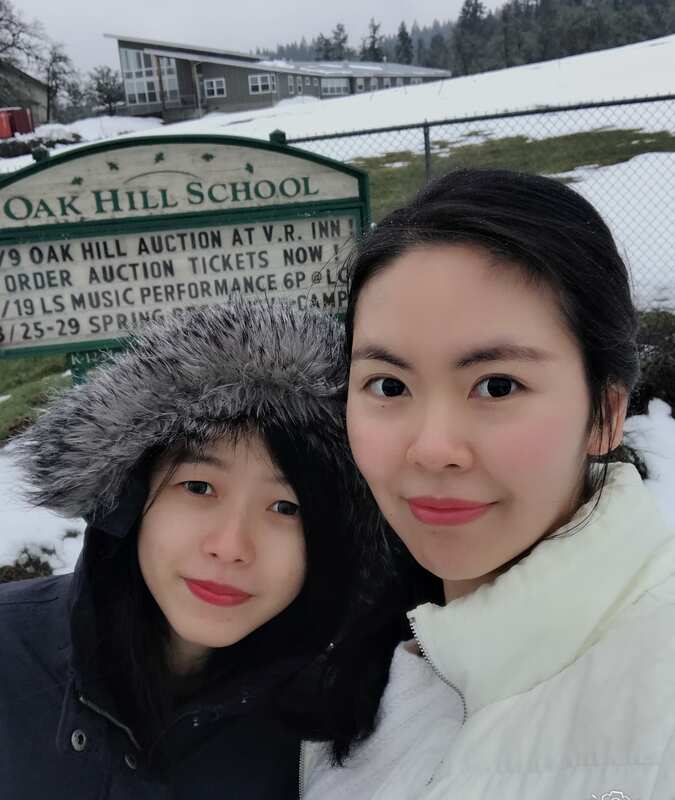 Yang and Zuxuan in front of Oak Hill School where they are assisting learners in Chinese. The snow is rare in Eugene! Hello Xuan and Yang! Tell us a little about yourselves. (Zuxuan) My name is Zuxuan Ni, sometimes my friends call me Xuan. I am from Beijing, China. I got married in Seattle and moved with my husband to Eugene three years ago. My interests include second language teaching and psychology and education. I like traveling. When I was studying for my first MA in psychology and education in England, I visited several European countries among which Denmark was my favorite. Now I am enjoying my time studying language teaching here in Oregon. I love this beautiful state very much and hope to become a Chinese language teacher after graduation. (Yang) My name is Yang Li, and I’m from Hunan, China, where foods are known for being spicy. It’s no surprise that I love spicy foods. I got married in my hometown two years ago and came to the US with my husband, who is studying at Oregon State University right now. I’m really happy to study in LTS program and met new friends, this is a valuable treasure for my life. What experiences in teaching did you each have before starting the program? (Zuxuan) I worked as an L2 English teacher at an international high school in Beijing for half a year. During this period, I planned and delivered English lessons to seven classes with 20 students in each class. It was a great experience in which I engaged in creating a stimulating learning environment and varying my students’ learning activities in class by providing more interactive tasks to practice. (Yang) I taught English grammar and TOEFL and IELTS reading before starting LTS. After graduating in 2013, I started working in an International high school for two years. During that time, I was responsible for teaching English grammar and tutoring students with their TOEFL reading. Then, in order to have more chances to gain teaching experience and work near my hometown, I got another job to teach TOEFL and IELTS reading in a private Language training center. 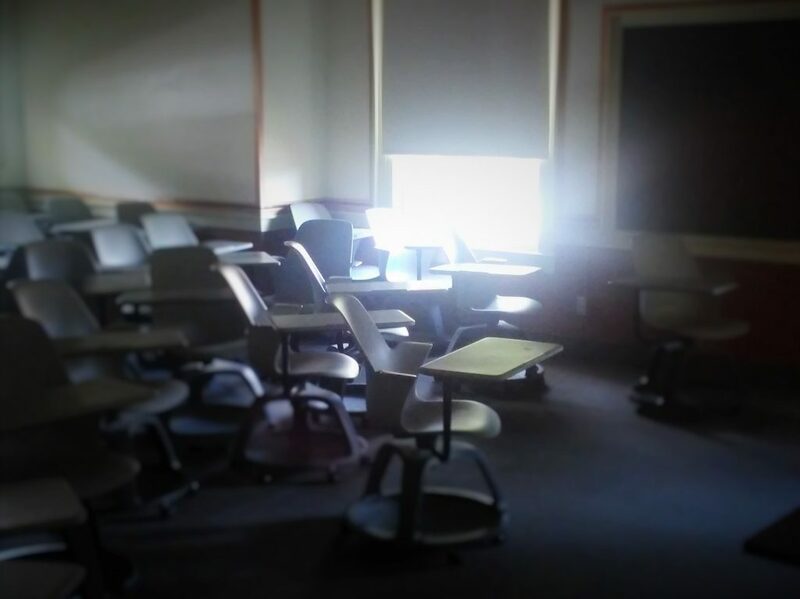 Normally, the class size was pretty small, with three or four students per class. I enjoy teaching students and being one of their supporters. However, I desperately felt that I myself needed to improve before I could really help my students to a larger extent. So that’s why I’m here. What attracted you to a program like LTS? 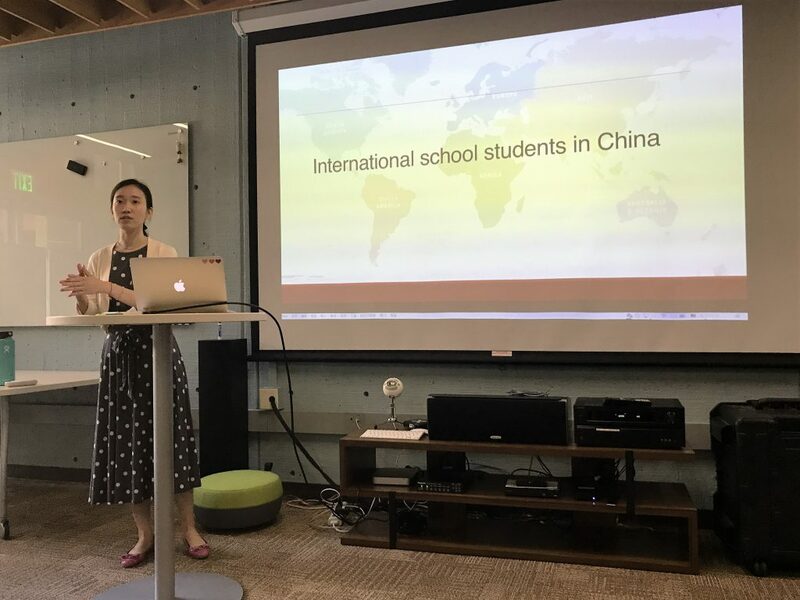 (Zuxuan and Yang) As we delved deeper into our English teaching work in China, we encountered some practical problems of developing our course designs and fostering students’ autonomous learning, which made us realize that we lacked some professional training in language teaching. This is why we are here in the LTS program. The courses offered by LTS are what we are expecting to learn. 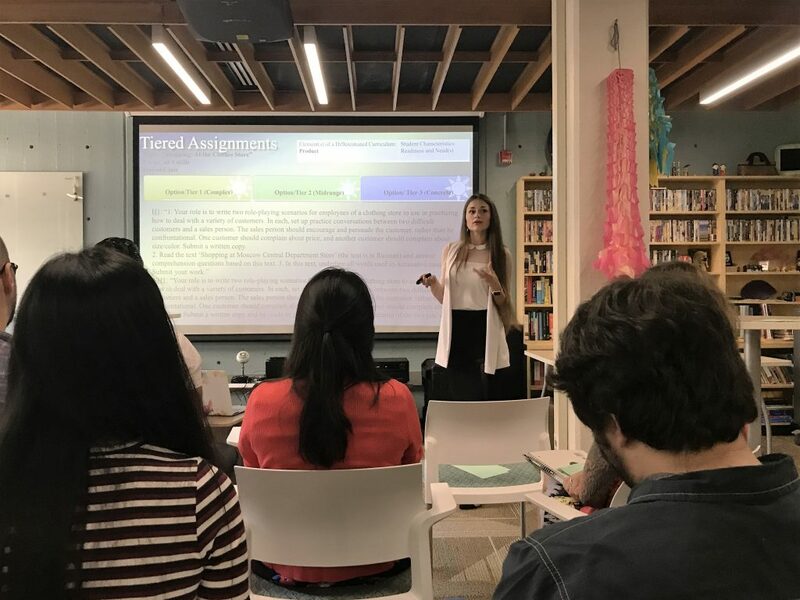 For example, in Second Language Teaching Planning, we learned how to analyze and examine the major methods used by L2 teachers to teach target languages as well as the principles and concepts associated with the L2 teaching. Such course perfectly met our learning needs and helped us build a firm foundation for a further career. We are very grateful for it and looking forward to the following terms! We’re glad to hear that! What are you doing now in the program? using higher-level constructions when talking to us. It is always a pleasant time with the students. What are you thinking of doing for your final MA capstone projects? students to learn distinctive Chinese structures. Hopefully, my final MA project can be useful for my future language teaching after graduation. (Yang) After graduation, I want to have more experience studying or working in the US. Therefore, for my final project, I’m thinking of teaching Chinese in a CFL context and to build learner agency by utilizing task-based language teaching principle in classrooms. And I’m seeking to see the effectiveness of the task-based approach in motivating students and in optimizing their learning experience. As a foreign language, there are not many opportunities for learners to practice Chinese, and mostly the learning behaviors are triggered by external incentives. So, I believe there is an urgent need to find how to encourage students to take initiative in learning Chinese. I hope my final project will be beneficial for my future teaching career. Finally, this program is intensive, and we are now more than halfway through it! Are you looking forward to the last spring and summer terms? (Zuxuan and Yang) Yes, definitely. We are definitely looking forward to the spring and summer terms. Because we may start guest teaching in different elementary schools in Spring and get more familiar with classrooms in the US. We are so excited about having these opportunities and experience. Also, we’ll start to write our final project and research for the topic we are interested in. Furthermore, we are really looking forward to the courses of these two terms, like the assessment and pronunciation course, which would benefit us a lot for our final project and future teaching career. 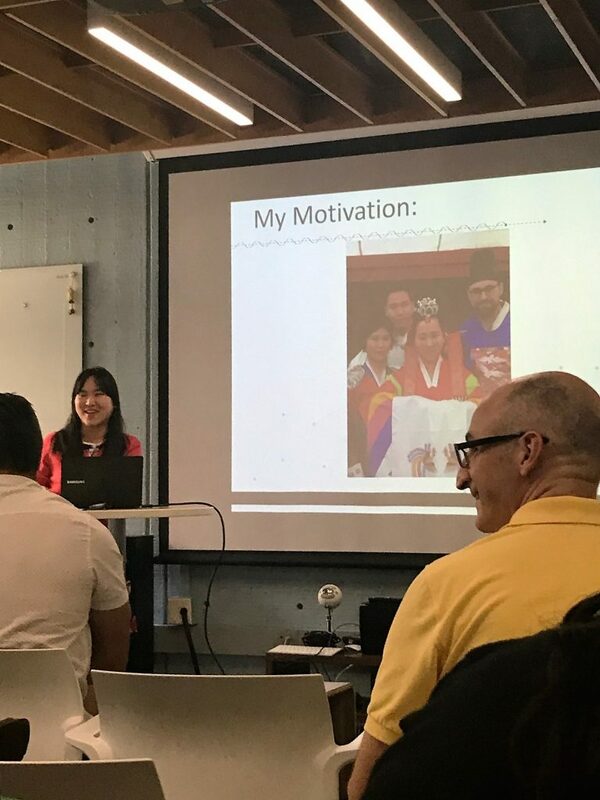 Kai Liu graduated from LTS in 2014 with an MA project titled Using Gamification in Chinese Teaching: A Gamified University Chinese Course for Advanced Students in the US. She very quickly started working as a Chinese Instructor in an innovative program in one of the more beautiful places in the world… Hawai’i! She recently stopped by in Eugene on her way home from a conference to say hello to her professors and friends. Read more about her path since LTS below. What is your position now? I am the instructor of the Chinese Language Flagship Program at the University of Hawaiʻi at Mānoa. I develop materials and teach Flagship courses (advanced Chinese courses). I also teach beginning to intermediate-level Chinese courses at the East Asian Languages and Literatures (EALL) Department at UH. Have you been involved in any special projects and/or conferences? 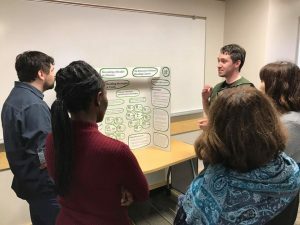 I am lucky to have been involved in the Green Ideas Simulation Project spearheaded by the Language Flagship Technology Innovation Center (Tech Center). This project aims to prepare Flagship students for their internship during the Flagship Capstone Year abroad. I helped pilot this simulation project in one of my Flagship courses at UH. More specifically, I developed instructional materials on how to write resumes and cover letters in Chinese and how to prepare for job interviews in Chinese. I also created rubrics for various tasks in this project. In addition, I shared my instructional materials and pilot experience with the Tech Center and other Flagship programs. Now several Chinese Flagship Programs participate in this project each year. This project is expected to be piloted in more languages. Apart from the simulation project, I am also involved in revamping the beginning and intermediate Chinese curricula at UH. 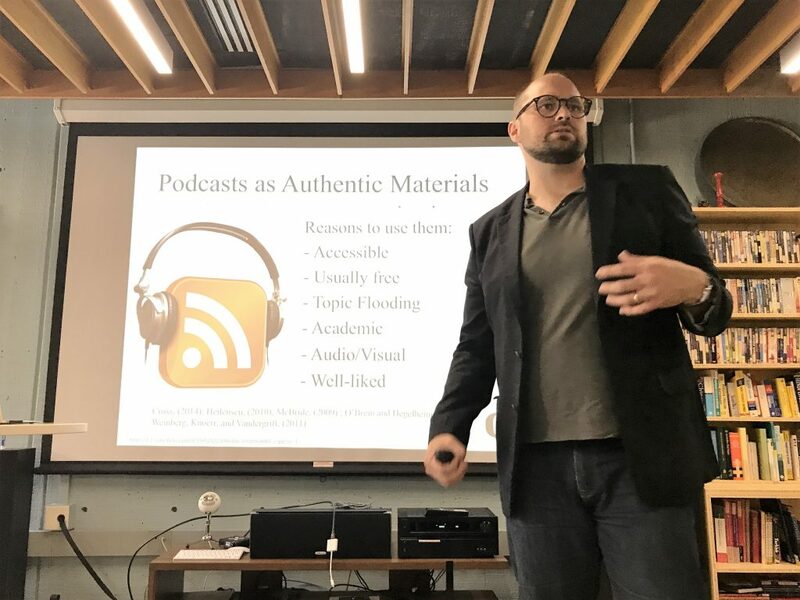 My colleagues and I are integrating blended learning and flipped classroom into these courses by creating more communicative activities, online instructional videos, and individualized learning materials. Is there anything from your time in LTS that you still think about now? Yes! The Computer Assisted Language Learning (CALL) courses are extremely useful! When I first started working at UH, I attended an online teaching orientation for faculty and I felt like I already knew how to use most of the technological tools mentioned in the orientation. I also think about Professor Holland’s Second Language Teaching Practice class. I remember how excited both LTS students and AEI students were in a communicative class. 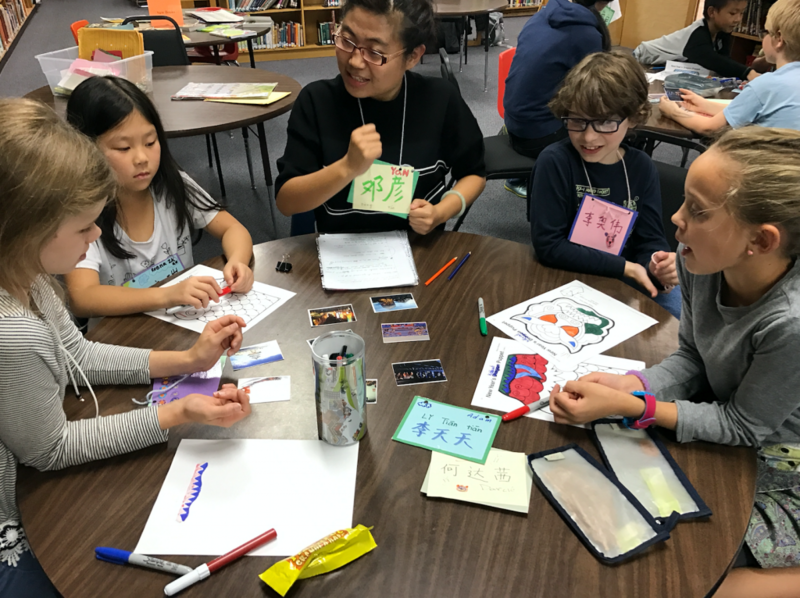 To create the excitement I once saw in that class, I have been trying to invite more guests into my classes and provide opportunities for my students to use Chinese in local community events. 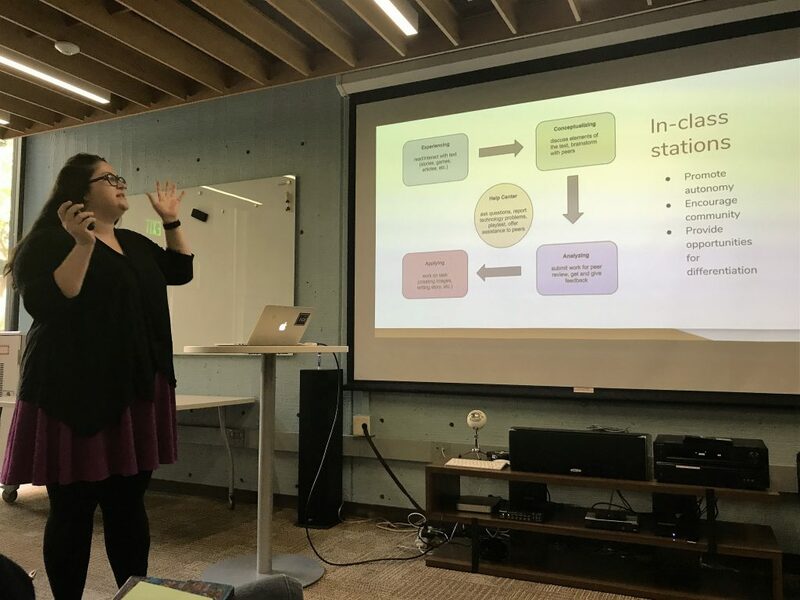 I still remember what Dr. Keli Yerian said in her commencement speech to my cohort: It is easy to fall back into traditional teaching approaches than applying what we learned in LTS to our classes. Her words serve as a daily reminder for myself to keep creating more communicative and engaging activities for my students. How did you learn about LTS? 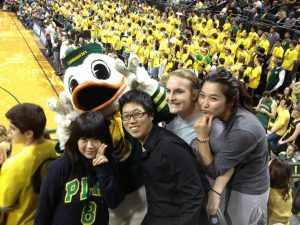 I first came to UO as an exchange student in the Oregon International Internship Program (OIIP). I learned about this program through Dr. Yerian and an LTS graduate Li-Hsien Yang. Do you have any advice for current or future LTS students? 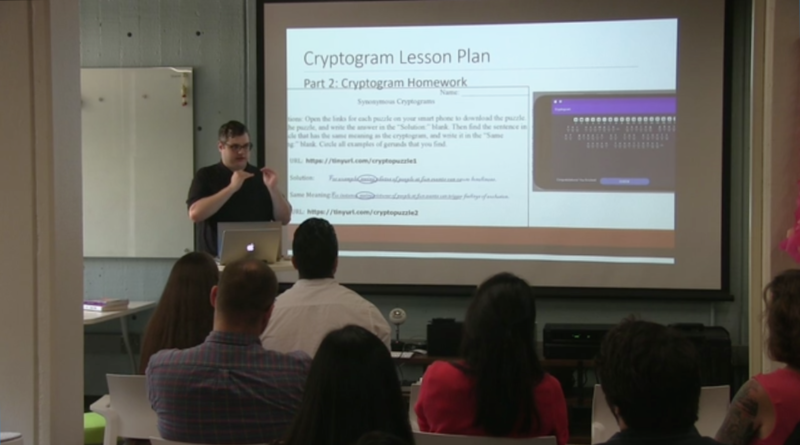 Apply what you learned in LTS program to your own classes. Challenge yourself and try new materials and new communicative activities. Do not be content with what you have. Enjoy each other’s company and learn from each other! I learned a great deal from other LTS students in and out of the classroom. It is my pleasure to introduce 2016-18 LTS student Sean Brennan. Sean is one of the many students who have pursued concurrent MA degrees in LTS and East Asian Languages and Literatures (EALL). Hi Sean! Please tell the world a little bit about yourself. 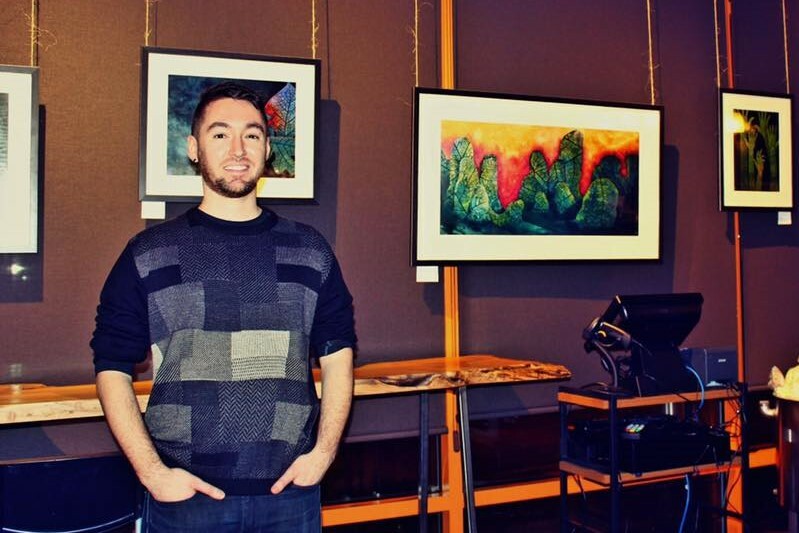 Sean at one of his art gallery shows. I’m a Kentucky native, but my interest in Chinese carried me away from there to spend a good chunk of my twenties studying in China, and eventually here in Oregon. I remember when I was a kid, I was fascinated by the idea that different people had different ways of speaking and writing, and longed to study foreign language. In high school, I was finally able to study my first foreign language which happened to be German. I enjoyed studying German, but it was only once I was able to study Chinese as an undergraduate that I truly fell in love with another language, and I’ve never looked back. 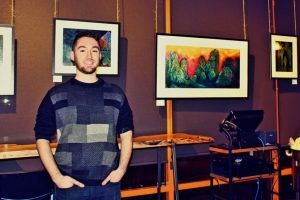 Outside of school, art and in particular, painting, has been one of my life-long passions and I’ve been fortunate to have a couple gallery shows since I moved to Eugene. You are quite the jack of all trades! So how did you end up in the LTS program? I believe I first heard about it from the instructor for my Chinese linguistics course here at UO. What has been your focus in the program? 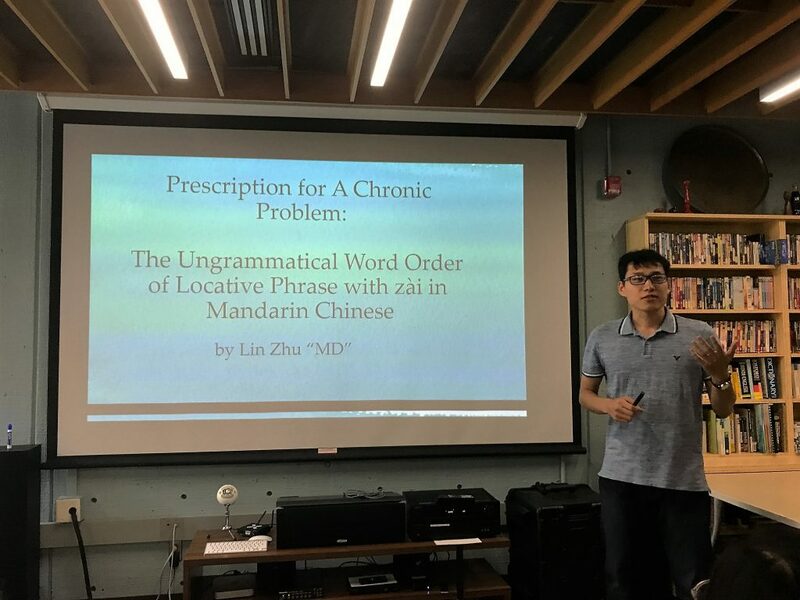 In participating in this program, my aim has been to gain the tools and knowledge to effectively utilize my experiences learning Chinese as a second language to inform my teaching of the language. 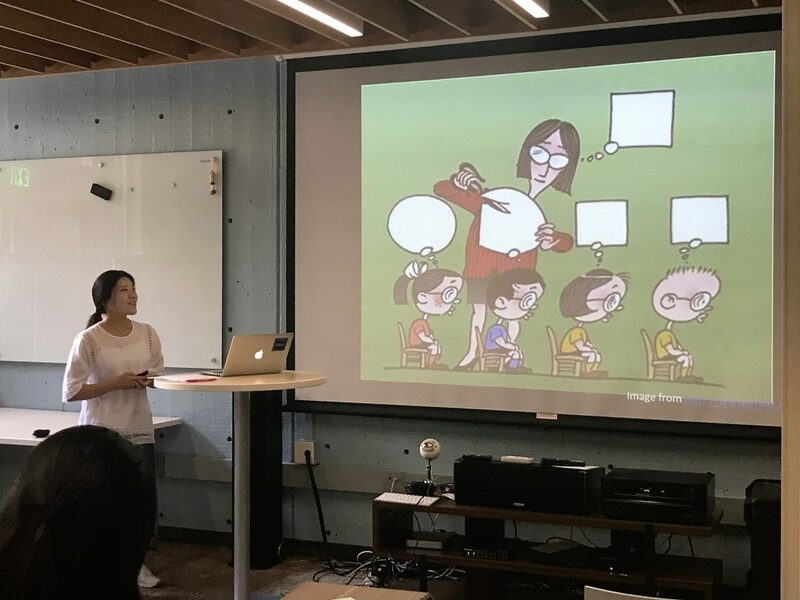 I believe my project represents a culmination of this effort, as it addresses a specific need of Chinese learners that’s not accounted for in current curriculum—bridging the gap between English reading and Chinese reading—which I recognized as a problem from my own experiences. Sounds like a great project! And you mentioned you are a GE (graduate employee) for Japanese literature, how’s that experience been? It’s been going great. 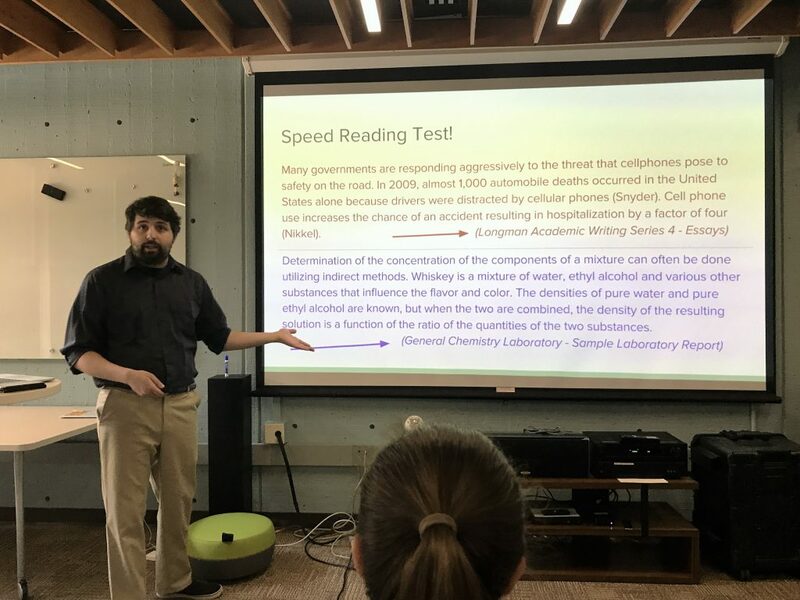 While I’m normally a GE for the Chinese department, teaching in the Japanese department is always a refreshing change of pace, and through the works we read, I get to see the cultural and linguistic exchanges between the two countries throughout history. Sean presenting at the LTS poster session. Are you excited to start working on your MA project? Yes, I really feel good about my project. I’ve received some really positive feedback from Chinese department faculty about the idea, and I think it’s possible it may lead to some serious consideration for adding a Chinese extensive reading course to the curriculum. Thanks so much for taking the time for this interview! Best of luck in the completion of the program! Hello Yuri! Please introduce yourself to our readers. Dàjiā hǎo! 大家好！Hey everyone – this is Yuri speaking! Here comes a little story about myself! 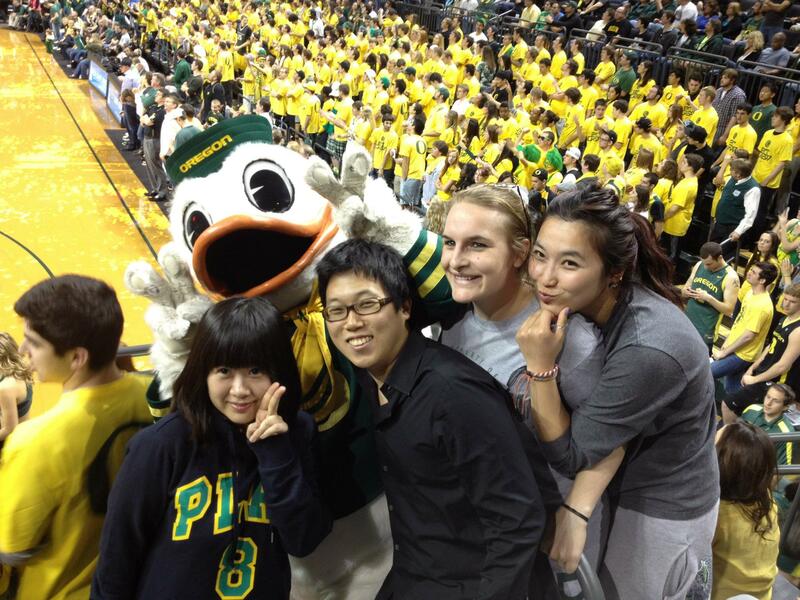 Born in Shanghai China, I moved to the U.S. in 2010 for graduate studies at the University of Oregon. I started with a Master’s program in Educational Leadership at College of Education. After a year, I was fortunate enough to meet some friends from LTS and found that the program was a perfect continuation of my Bachelor’s study in Teaching Chinese as a Foreign language. Therefore, I decided to study two master’s programs concurrently in 2011 and was so lucky to be able to finish both by summer 2012. Generally speaking, a graduate like me can easily have wanderlust – where there’s a job, there’s a home. Can you tell us more about what you’ve been doing professionally since you graduated from LTS? I first worked as an associate teacher at Chinese American International School (CAIS) in San Francisco, teaching Chinese in a 1st Grade and a 5th Grade classrooms. 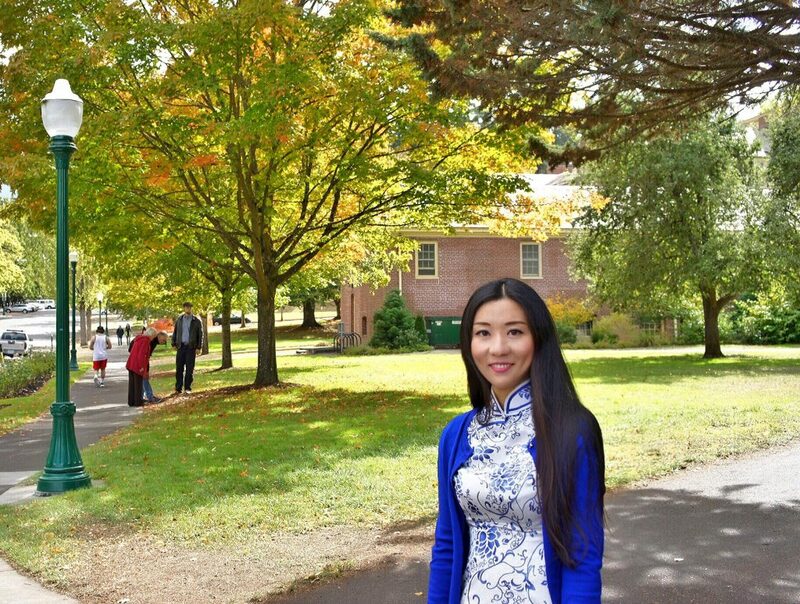 After a year, I joined Hope Chinese Charter School (HCCS) in Beaverton and worked as a Chinese immersion teacher as well as the Chinese curriculum coordinator. 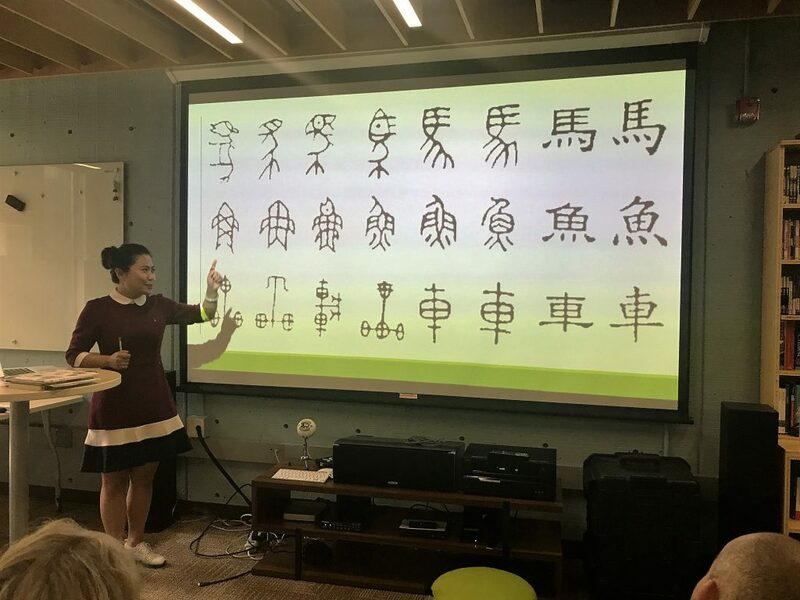 In addition to developing the Chinese program benchmarks and curriculum for HCCS, I taught students all subjects areas in Chinese from 1st – 4th Grade. In my 3rd year at HCCS, I became the director of the Chinese immersion program and the lead Chinese immersion teacher. 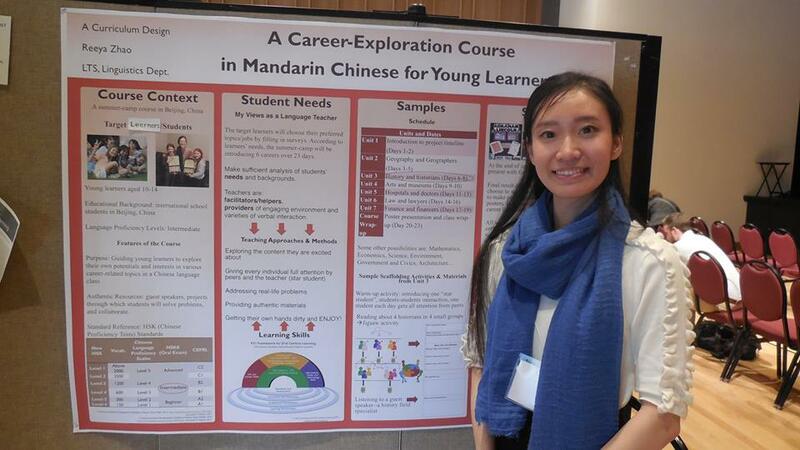 My job responsibilities range from program and curriculum development to Chinese faculty mentoring. I also wrote the STARTALK grant and got accepted for two years to implement the student and teacher training programs in Portland, which definitely helped consolidate my skills in language program development. So now you are off to your next adventure in Singapore – what will you be doing there, and how does it fit with your future career goals? I will be teaching in their newly established Chinese immersion program and hopefully make my own contribution to their Chinese teacher professional learning community. Though it seems that it was a step-down move, it will be instrumental as I have never worked at an international school and it is always a field I’d love to explore on my career course. I am always interested in educational leadership at international schools. I believe this will be a necessary transition to lead me toward that goal. What did focus on while you were a graduate student at UO? I actually had different yet later connected focuses in my two graduate programs. I focused more on comparative education in my educational leadership program, and teaching strategies for increasing language proficiency in my LTS MA project. 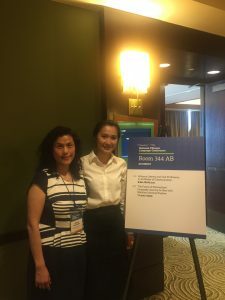 With my post-research in Chinese immersion education after graduation, it is so apparent that language education should always be intertwined with cultural learning and studies. The teaching techniques could also be varied or fused between different educational systems. 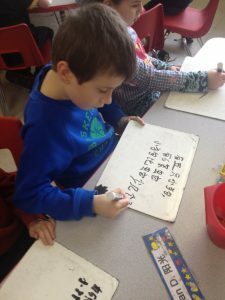 At least Chinese immersion education can speak to that – we teach American students with an American-based curriculum and certain Chinese schooling rituals. I will definitely continue with my research in this area and hope to extend my study into the impact of foreign language education on school systems. What has ended up being most useful for you as a teacher from what you learned in LTS? The second language teaching principles and the theories behind second language acquisition vs. language learning are really the essence to help me understand how language proficiency should be developed. I can never forget Celce-Murcia’s representation of communicative competence, which really became the theoretical basis I go by while developing my language teaching strategies. I was able to have a good understanding on the national standards for learning languages, thanks to what I have studied about Communicative Language Teaching (CLT) in some of the LTS courses. In a nutshell, the learning in LTS helped me tremendously in my language teaching career. It was my first time to trust that college/graduate studies can actually greatly benefit the career practice. Looking back, do you have any advice to current or future LTS students? No. 1, study well, pay attention to what you are/will be learning with LTS, because whatever you have experienced with LTS could become very instrumental to your language teaching career (if that’s what you choose ultimately). No. 2, better not neglect the study of the theories and always pilot any strategies that you create with a real class body. I am not an empiricist, neither a rationalist. I believe we should rely on both to reflect back and forth. Sometimes theories inspire a way. Sometimes practice finds the theory. Last but never the least, enjoy what you are learning and what you will be doing as a LTS fellow! 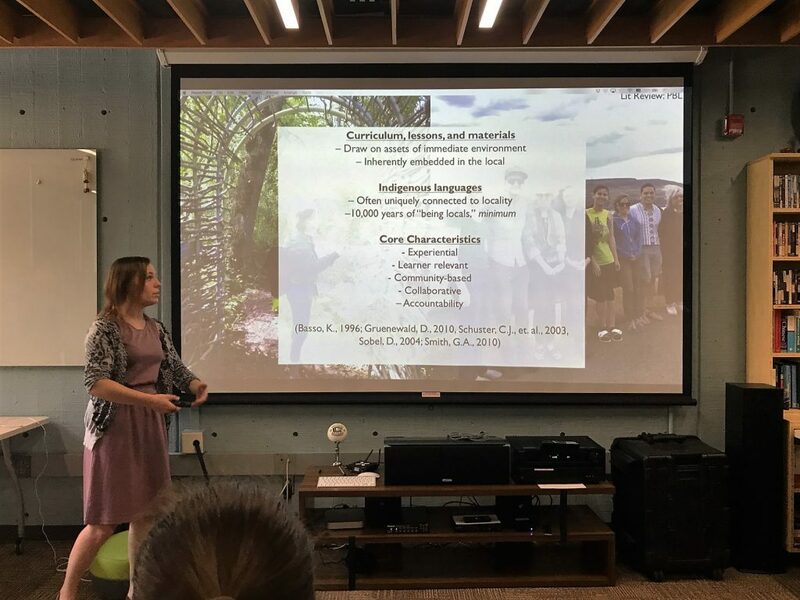 As the 2016-2017 LTS program comes to a close, the presentations are finished and the finalized projects are rolling in! As this year’s cohort gets ready for their next big adventures in the wilds of language teaching around the globe, this final blog post for the Summer 2017 term will provide a brief glimpse of the hard work and dedication the graduates have put into bettering themselves as language educators, and into bettering the world of language education as a whole. If you missed out on the presentations this year, here is a small gallery of snapshots of each presenter’s work! How did it feel leading up to the presentations? How does it feel to know that you have the presentations behind you? What were the most difficult or the easiest parts of giving the presentations? Any suggestions for future cohorts? No matter where we go, and no matter what we do in the future, let’s always remember and think back to the knowledge, experience, and camaraderie we shared with one another as we grew into professional educators together. Even if we lose contact, or never find ourselves in a shared space again, we can always provide inspiration to one another to achieve our best, and to work hard to mold the world of academia as we see fit! For these reasons, I believe it is not necessary to say goodbye, but simply to say good luck to the 2016 – 2017 LTS cohort. I know we will all move on to do great things! Thank you to my cohort members for all of their support! I hope to see you all again soon. Tell us about yourself! Where are you from? What kind of work have you done? Hello, my name is Adam (天天). I come from a small city with over 2,500 years of history – Kaifeng, China. Becoming a foreign language teacher has always been a dream I am enthusiastic about. Before coming to the US, I got my bachelor’s degree in Teaching Korean as a Foreign Language in South Korea. After graduation, I did different types of jobs including Chinese teacher in a Korean academy and liaison of international affairs in a Chinese college. You are also completing a degree with the East Asian Languages and Literatures department. Can you tell us about what brought you to the LTS program? I started my studies at the U of O in 2015, with my first major Korean Linguistics. Knowing that I have interests in language teaching, my advisor Professor Lucien Brown suggested me taking classes in the LTS program in order to fulfill my graduate requirements. However, what I learned from the first course – Curriculum and Teaching Material Development was way beyond my expectation. Realizing the tight connection between my first major department and LTS, I went on taking more courses in both programs. In summer 2016, with the help of the program director Professor Yerian, I got accepted by LTS as a concurrent degree student. Courses I took in the LTS program have strongly helped me to achieve my career goal. Those courses refreshed my mind with teaching methodologies, second language learning theories and other skills that I hadn’t thought about or been aware of. Could you tell us a little bit about the ideas that you have for your Master’s project? This summer, I am going to finish the draft of my Master’s Project for LTS. This research report shows evidence that what affects the judgement on accentedness of second language learners from Korean native speakers are the errors in applying “pitch pattern” of phrases. Could you tell us about any internships or GE positions you’ve had at the UO? In addition to my studies, I am also enjoying a couple of opportunities to apply the skills I have learned from the classes. During weekdays, I teach beginner level Korean as a Graduate Teaching Fellow. The class consists not only American students but also a large portion of international students who are also interested in Korean language and culture. Every Friday afternoon, I meet kids in the Edison Elementary school for a Chinese Language and Culture Club. 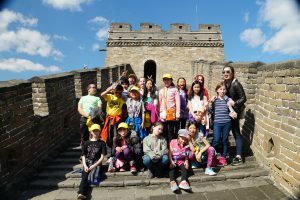 This after-school club offers Grade 3-5 kids the chance to experience very authentic Chinese culture as well as tons of fun games. In both classes I feel rewarded for seeing students loving the activities I design and the language and culture I share with them. Tell us about yourself! Where are you from? Where have you studied? Do you have any hobbies? My name is Reeya Zhao, and I’m from Beijing, China, where I spent most of my life before turning 18. The city of Beijing is a mix of ancient, modern, domestic and overseas sites and cultures. People come and go since they can find both opportunities and challenges there. At the age of 18, I decided to leave to attend the East China Normal University in Shanghai, and that’s where I found the Disney summer internship and the OIIP programs in 2014. I worked at Walt Disney World in Orlando, Florida for two months as a merchandise representative before OIIP. This was technically my first overseas job, and I had so much fun because we often stocked past midnight after the garden closed and I met many Disney characters backstage. OIIP is an international internship program at the University of Oregon. 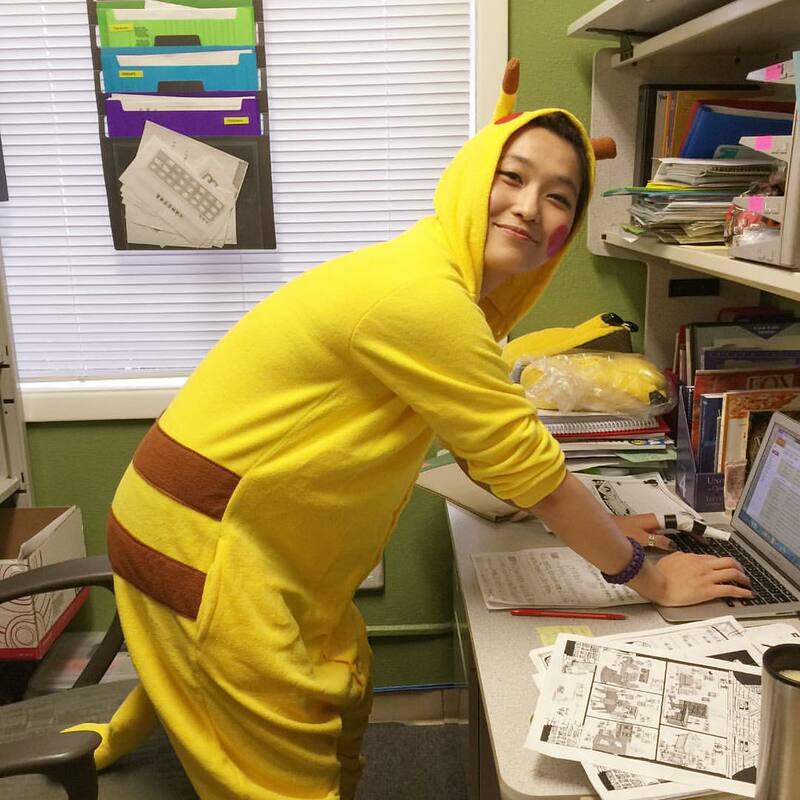 During that 5 months, I took two courses at the UO while working as an intern in the kindergarten department of Mt. Vernon elementary school, with two teachers and two teaching assistants. After that, I made my decision to be a language teacher and come back some day pursuing further education. Has the LTS program brought you any extracurricular opportunities? Now, it has been almost one year for me studying in the LTS program. As an international student, I feel it’s very intensive yet worthwhile. By following the suggestions of which courses to take from our coordinator Dr. Keli Yerian, I feel that each term is a little bit more intensive than the previous one. The Gaokao (China College Entrance Examination) was the first high pressure educational experience for me, and the LTS cohort and program are the first ones to push me to become more professional in various ways. 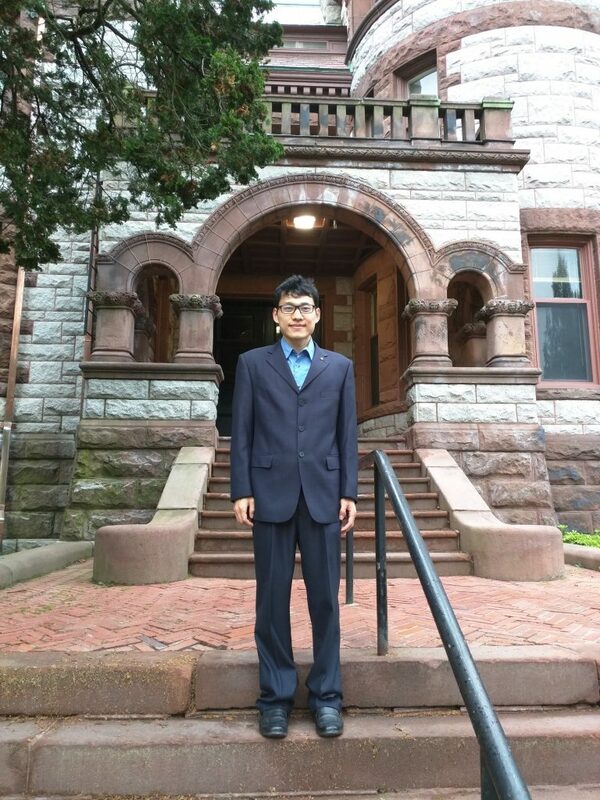 In the Fall and Winter terms, I participated in the Edison Chinese Club Program. Two other Chinese cohort members (Yan and Adam) and I planned and taught Mandarin lessons together after school on every Friday, and were directed by Professors Keli Yerian and Lara Ravitch. This was challenging at the beginning because not only did we need to think of attractive activities and how to best sequence all of it, we also pre-planned for imagined classroom management problems, and sometimes dealt with unexpected situations. For example, with planned small group activities, some kids might feel like working alone on some days, and we would come up with an “emergency plan” to let him/her be out of the group for a while. However, we always reminded ourselves to encourage them to come back eventually, because cooperation is one of the essential skills we want the learners to develop further in our Chinese club. Tell us a little bit about your Master’s project! What is the context of your project? My Master’s project is a course design for young learners of ages 10-14 studying at international schools in China. I believe that students within this age range are developing their awareness of future careers, and they need the language as a bridge between them and the outside world in this foreign country. Due to these reasons, I’m thinking of a career-exploration course taught in Mandarin Chinese to formally develop their multi-language and multi–culture abilities. What are the most valuable aspects of the LTS program as you’ve experienced it so far? I also value the circumstances of discussing, sharing, and working together with all the cohort members in LTS. I also love the various connections provided by all my instructors and the courses they lead. For example, in the Talking with Ducks course led by Professor Laura Holland, we had three classes each week. On Tuesdays, all the TWD teachers carefully planned and discussed the chosen activities together. On Thursdays, we actually taught in an English conversation college course for international students. Then, on Fridays, all the LTS cohorts got into the class to debrief and reflect how we did on those Thursdays. Last but not least, I also like the LT 536 course design and the LT 549 testing and assessment classes where I was pushed to design a course and assessments. In doing so, I was given the motivation to research and look into the use of authentic materials. Tell us about yourself. What do you study? What kind of work have you done? Any hobbies? Ni hao! 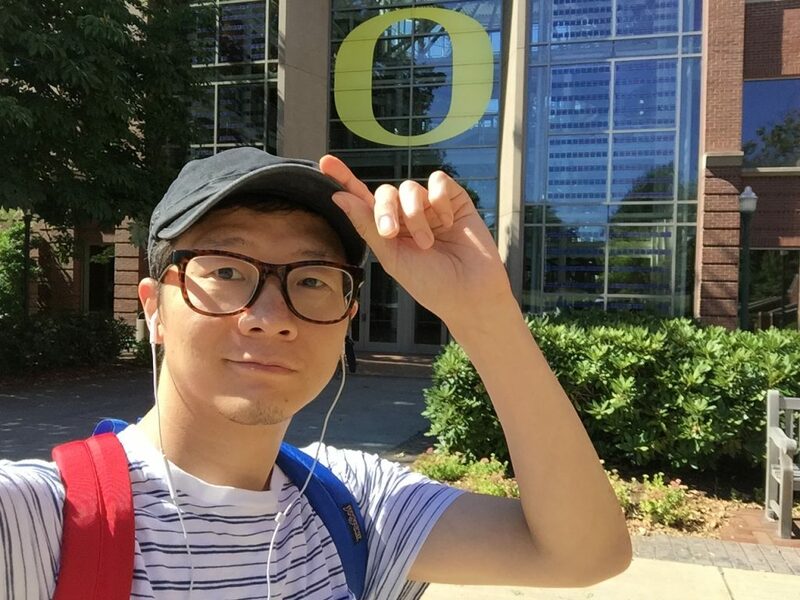 Hello, I am Lin Zhu, a graduate student at University of Oregon. Right now, I am in two programs: I am a PhD student in East Asian Linguistics program in the Department of East Asian Languages and Literatures and also an MA student in LTS program in the Department of Linguistics. My research interests include Chinese syntax, semantics, and SLA (primarily concerning Chinese teaching and learning). 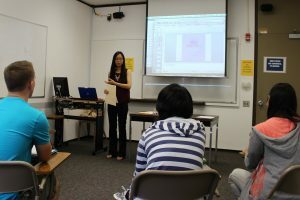 Here at the U of O I have been a teaching assistant for 2nd-year Chinese classes and now I am a TA for 1st-year Chinese. I am a Chinese guy working towards being a Chinese teacher. My ultimate goal is to teach Chinese in a university setting. I’m a fan of sports; basketball, badminton, table tennis, etc. I especially enjoy jogging and walking on the track. Tell us about completing two concurrent degrees with the LTS and EALL programs. How does the work you do in LTS relate to EALL? Well, you can imagine doing two programs at the same time is sometimes tiresome. Things keep coming up in my to-do list and the homework is always due very soon and seems to go on and on. I am a person who is early to bed and early to rise. But sometimes things keep me so busy that I become someone who is late to bed and still early to rise. I can easily find a balance between what I do in the EALL and LTS programs. The EALL program is theoretical. I get solid theoretical instruction from this and I get deeper understanding of the Chinese language. Also, the EALL program provides me with theoretical frameworks and methodological toolkit to conduct academic research. On the other hand, the LTS opens another door for me. It shows me the applied side of linguistics study. It gives me the theoretical underpinnings of language teaching and learning which is applied to a variety of real-life language teaching experiences. Also, as a TA in EALL, the time in LTS makes me a better teacher. 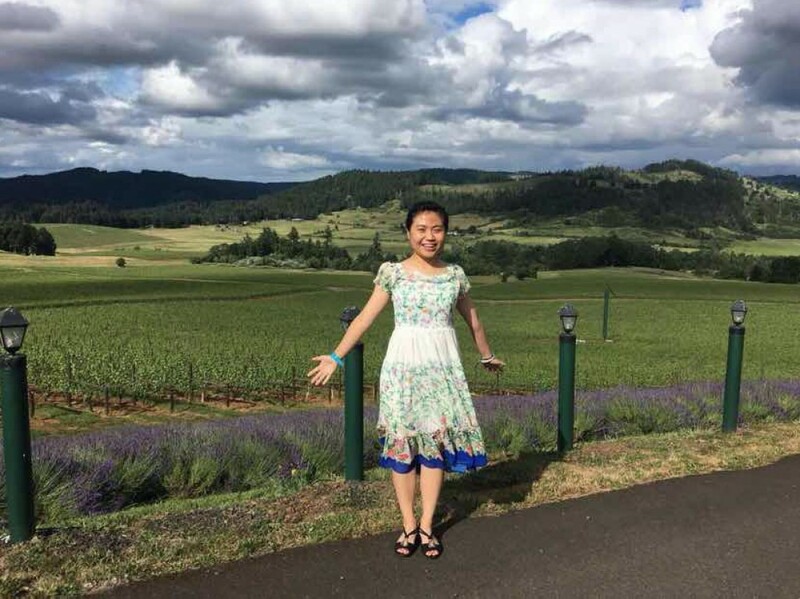 Heidi Shi (Shi Hui 石慧) is currently a second-year Ph.D. student majoring in Chinese linguistics in the EALL (East Asian Languages and Literatures) Department of UO. Besides the doctoral degree, she is also currently working on an M.A. degree in LTS (Language Teaching Specialization) in the Linguistics Department, wishing to train herself into a qualified language teacher at the college level. Heidi’s research interests include Language and Gender, Neologism, Chinese Pedagogy and so forth. 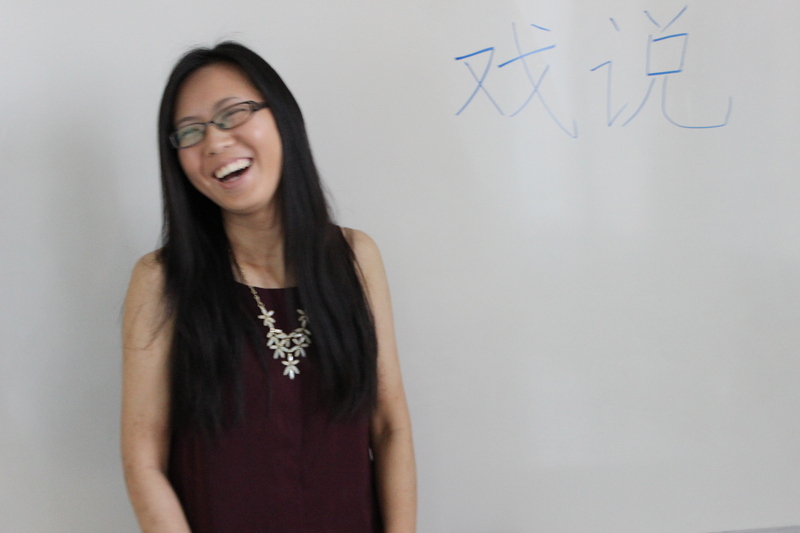 She has enthusiasm and experience in teaching Mandarin Chinese at both Novice and Advanced levels. 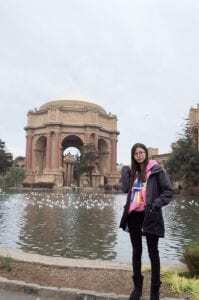 Originally from Shanghai, China, Heidi spent 2 years living in Japan as well as 6 years studying and working in South Korea before she moved to the United States in 2015. Besides getting a Bachelor’s in Economics and a Master’s in International Studies and East Asian Studies, she has spent most of her spare time during her 20’s traveling in Europe, Asia and America. 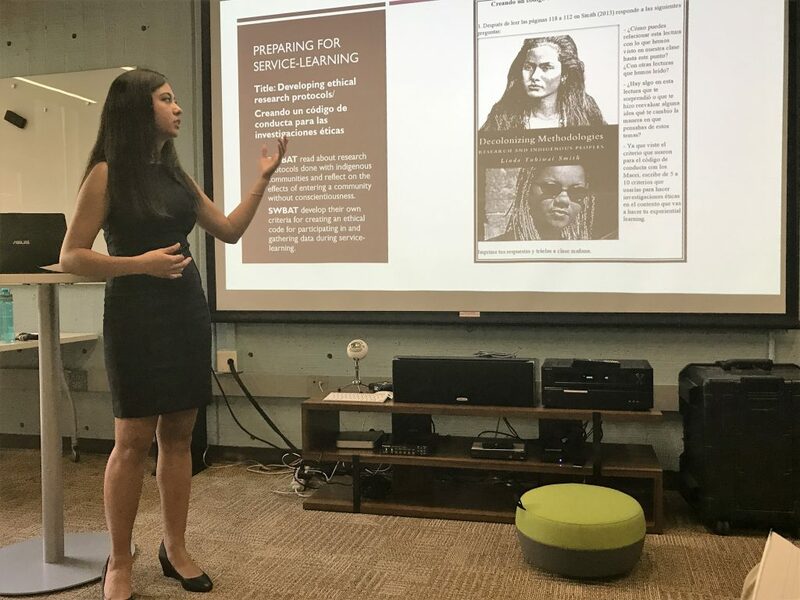 Her identity as a global citizen is her intrinsic motivation that drives her to make efforts in the field of language teaching and cross-cultural communication. She believes that Language is not merely putting sounds, symbols, and gestures in order to communicate with another community. From a cognitive perspective, language is how we present and express ourselves as individuals, communities, and nations. Heidi also believes that culture refers to a dynamic social system in which conventionalized patterns of behavior, beliefs, and values are integrated. Therefore, her teaching philosophy is: language acquisition should always be closely connected with acculturation because culture provides the environment in which a language is developed, used and interpreted. She is also firmly convinced that teaching and learning languages can promote cultural exchange and cross-cultural understanding, which in the long run, may facilitate international collaboration or even the realization of world peace. 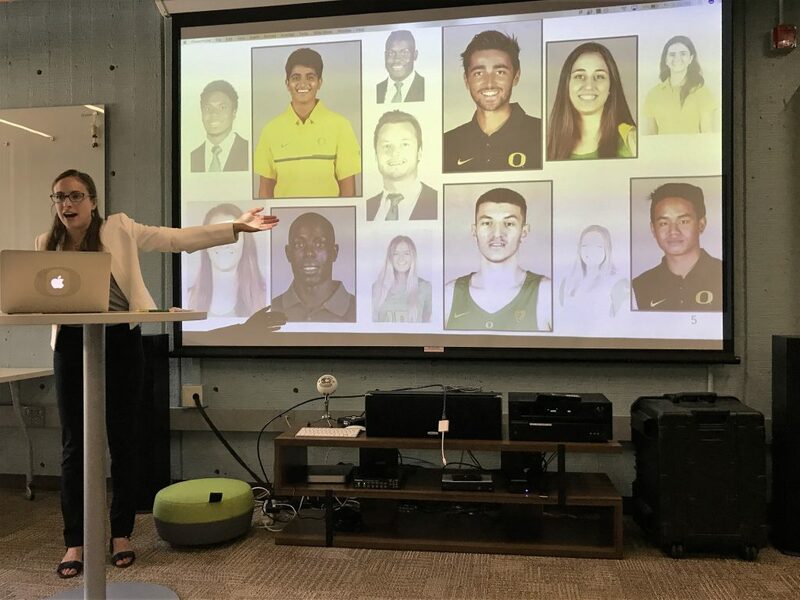 Since Fall 2015, Heidi has been working as a GE at UO. Her GE work contains 4 types of assignments. First, she has been teaching first-year Chinese at UO for 4 terms, which includes CHN 101 to 103 as well as the newly established accelerated class CHN 105. She teaches the Wednesday and Friday drill sessions for the various Chinese classes. Based on the principle of building a communicative language classroom, her lesson plans usually contain a lot of activities through which the students can have more opportunities for producing the target language, negotiating meanings and receiving authentic inputs. Second, she also works as a tutor and disciplinary mentor for the Chinese Flagship Program undergraduate students. She has tutored over 10 Flagship students either in their Chinese-related major coursework or OPI (Oral Proficiency Interview) preparation. She likes adopting the “4-3-2” method in 1-on-1 tutoring to increase each student’s fluency. Besides that, she also cautiously provides feedbacks and corrections, aiming to improve learner accuracy. She also works for the Chinese Flagship Program as a graduate coordinator. 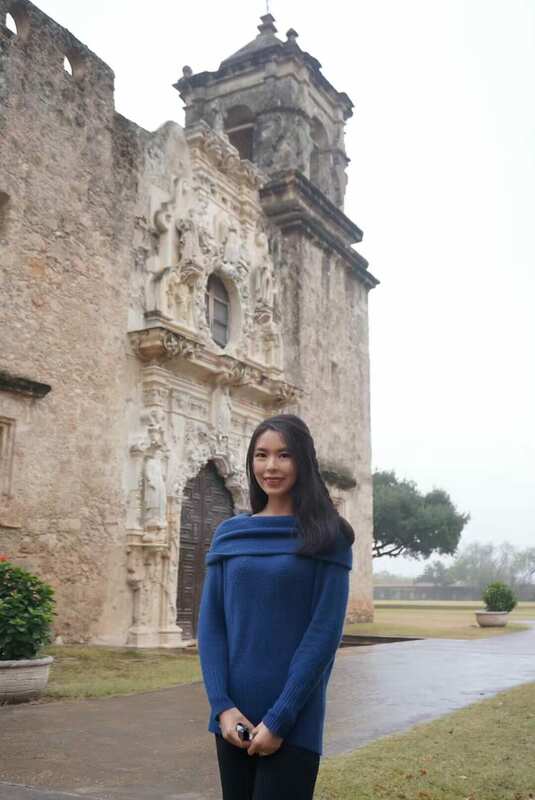 Cooperating with the student leader team “Banzhang,” her job is to hold weekly meetings with the Flagship students. Using only Chinese, Heidi communicates with the Banzhang team and helps them arranging termly or yearly Flagship events. Finally, in Fall 2016, Heidi was the GE of EALL 209 (East Asian Languages and Societies). It was an undergraduate level lecture taught in English which mainly introduced Chinese, Japanese and Korean societies and their related cultural backgrounds. 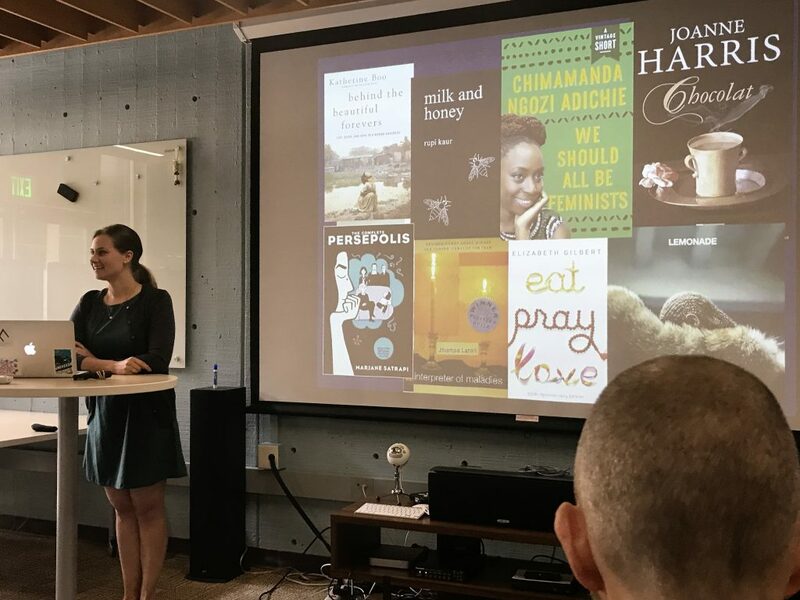 Heidi was the grader of EALL 209, and she also taught 2 lectures in this course the contents of which were about Chinese politeness and metaphors. Why did you decide to join the LTS program? Is there anything you look forward to doing in the program? The reason why I applied for LTS lies in the strong theoretical and practical professional foundation that this program can provide to its students. On the one hand, I wish to systematically study the principles and theories of language acquisition and pedagogy. 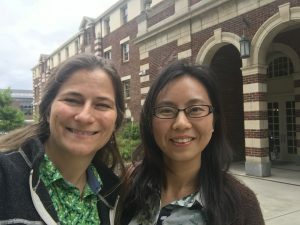 I am interested in reading the most cutting-edge research articles in language teaching as well as discovering any research gaps that may occur or have appeared in teaching Chinese to L1 English speakers. On the other hand, LTS is also a valuable resource that facilitates my language teaching as a GE. I have been adopting a lot of methods and approaches I have learned in the previous LTS classes in my classes where I teach Chinese. I also wish to obtain a profound understanding of the domains of teaching method, lesson planning, curriculum development, etc. Tell us about yourself! Where are you from? What did you do before joining the LTS program? Do you have any hobbies? My name is Yan Deng and I come from Lanzhou, which is the capital city of northwest China’s Gansu province. The city is not very big, but there are still 2 million people who live there. My favorite food is Lanzhou beef noodles, which is a very famous food in China. Before I came to the U.S.A, I already got my bachelor’s degree at a Chinese university. My major was Chinese Education. I wanted to know about different cultures and to learn different languages, so I decided to study abroad. In 2011, I came to the University of Oregon, and my major was Educational Foundations. In class, I learned a lot about American teaching methods. Outside of class, I tried to learn more about American culture, such as how American students celebrate holidays, how they work on campus, and how they chat with their friends at cafes. I have been in Eugene for 5 years. Eugene is a small, quiet and beautiful city, and I love living here. While I was an undergraduate student at UO, I volunteered at an American elementary school for two years. I noticed there were a lot of differences between American elementary schools and Chinese elementary schools. 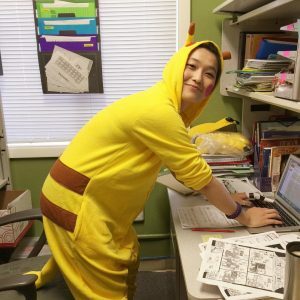 I have been a Chinese tutor for one-and-a-half years at UO, and I liked the job so I am still doing it now. I love to encourage American students to know more about China and to learn Chinese. I think we could all learn from each other. Hobbies? I like swimming and reading. My favorite books are the Harry Potter series. Sometimes I like to watch American TV shows, such as CSI and Criminal Minds. To be honest, I get scared by some of the plots. Tell us about Talking with Ducks. What is that experience like for you? For me, I like the TWD class because I can learn a lot about teaching. The most important part is how the team members help each other. For example, I was a leader in week 2. I had to make sure my pronunciation was correct, and the rules of my game had to be clear. Since I am an international student, I have to worry about these things. To be honest, I wrote down every sentence of my lesson plan, and I read them to my team members, Devon and George. They helped me to edit my lesson plan. I was so glad they were so patient with me. No one loafs around on the job! In Thursday’s class, when students came in , we didn’t feel nervous because we were ready. But there were still some situations that I hadn’t thought of before. Thus, we needed to help each other. 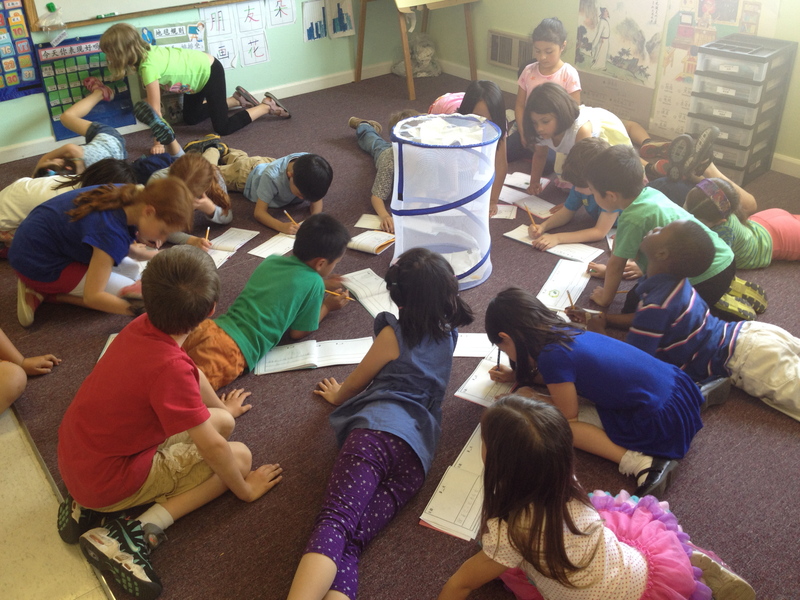 For example, I didn’t realize students would still sit a big circle after I separated them into different groups. I didn’t know how to solve the problem, but George quickly jumped in and gave more explanation to solve the problem. When students were playing the game, I forgot to explain the game time limit, but Devon was on it. How about the other LTS Ducks? Yes, they all did very well. Sue and Maude were very creative in their groups, letting their group members use the envelopes (which were just materials from my activity) in the game. Joliene, Reeya and Juli built a great and comfortable environment for their group members to practice English. Laura, the professor of the TWD class, made sure everything was going very well. Because of this teamwork, I love the class and I enjoy every minute of it! Tell us about the Chinese Club! The Chinese Club is held at the Edison Elementary School, and is one of the after school clubs. In our club, we have 11 students who come from different grades. The goal of the club is to encourage students to learn about Chinese culture as well as some simple Chinese characters. We tried to build a real language environment to help students learn Chinese. Last week, our topic was “daily life in Beijing.” We created some class activities to help students know the real Beijing, such as visiting the Summer Palace and the Forbidden City, and eating Beijing duck. What are you most excited to learn or do in the LTS program?